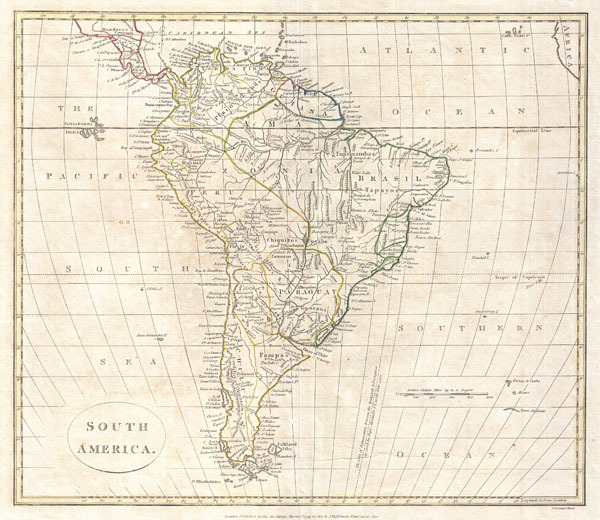 A fine 1799 map of South America by the English mapmaker Clement Cruttwell. Covers all of South America as well as parts of Central America as far north as Honduras. Crutwell identifies a number of indigenous peoples throughout as well as missions stations and fortifications. The Line of Demarcation, a boundary set up by the signing of the Treaty of Tordesillas on June 7, 1494, runs through Brazil. This treat divided the newly discovered lands outside Europe between Spain and Portugal, along a meridian 370 leagues west of the Cape Verde islands. The lands to the east would belong to Portugal and the lands to the west to Spain. Outline color and fine copper plate engraving in the minimalist English style prevalent in the late 18th and early 19th centuries. Mountains and topographical other detail shown by profile. Also makes note of rivers and shoals. Drawn by Clement Cruttwell and published in the 1799 Atlas to Cruttwell's Gazetteer.